At Sonesta ES Suites, we pride ourselves on being a brand that offers our guests more than just a place to stay. We give guests a place to relax, a place to be productive, and yes….a place that’s just a little more fun! 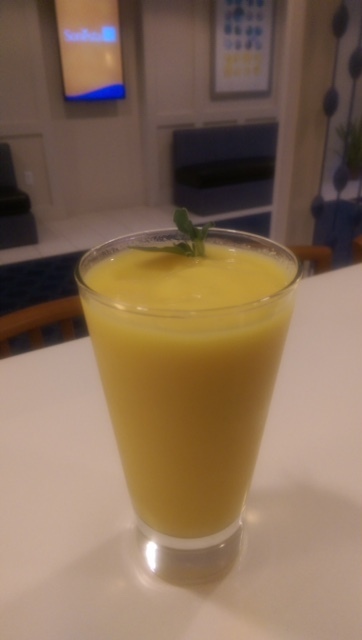 In celebration of our friendly new bar area, the Pour, and in honor of Beverage Day on May 6th all 16 Sonesta ES Suites will be featuring a free Pineapple Mango Smoothie. So grab a seat either indoors or outdoors in our communal areas, sip a refreshing smoothie and enjoy the day! The Pour is the perfect spot for guests after a long day of travel, work or play to mix and mingle over a tasty beverage. Featuring seasonal smoothies, specialty coffees, and more, the Pour offers yet another community gathering space for guests to socialize in the heart of our hotels. It’s part dining room, part lounge, part clubhouse and of course, all fun. We look forward to seeing you on May 6th! If you can’t make it don’t worry – this delicious smoothie will be on our menu moving forward at the Pour nationwide and we have shared the recipe right here on the blog so you can whip one up at home too. Place all ingredients into a blender and blend for about 30 seconds.